I prefer using homemade spice blends like garam masala, tandoori masala, etc., over store-brought ones . Making these spices blends fresh at home has unique satisfaction of solving the mystery of what goes into it. And also, a little quantity goes a long way giving flavor punch to the dish and hence cost effective too. I have a strong inclination toward sweet spices like cinnamon, cardamom and fennel. Apart from garam masala, madras curry powder is one such famous spice blend that is hot and spicy with sweeter tones. It is made with dried red chilies, curry leaves, mint and warm spices including my sweet spices. It is of course originated in Madras (now Chennai) and is used in popular non-vegetarian curries. Though, it features many spices and herbs, I used what I had in my pantry and the flavor was outstanding. So I thought I should share it here with a quick and easy recipe. It pairs perfectly with any meat and seafood and I am sure will go very well with dal(lentils) and vegetable gravies. This time I used this spice blend as marinade to my grilled chicken. We enjoyed it as a side dish for our comfort food, kichdi (Rice and Lenthil preparation). 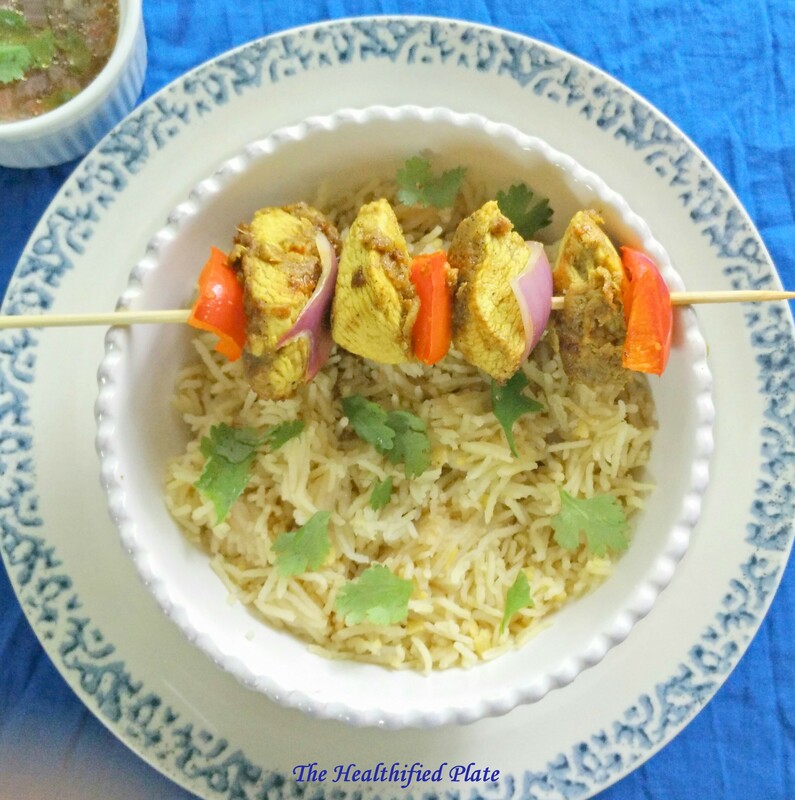 You should try this quick and easy Grilled Chicken which is spiced up with Madras Curry Powder and experience a different flavor of your chicken. Dry roast all the ingredients for spice blend except turmeric powder and blend into fine powder. Add turmeric and store in air tight container. 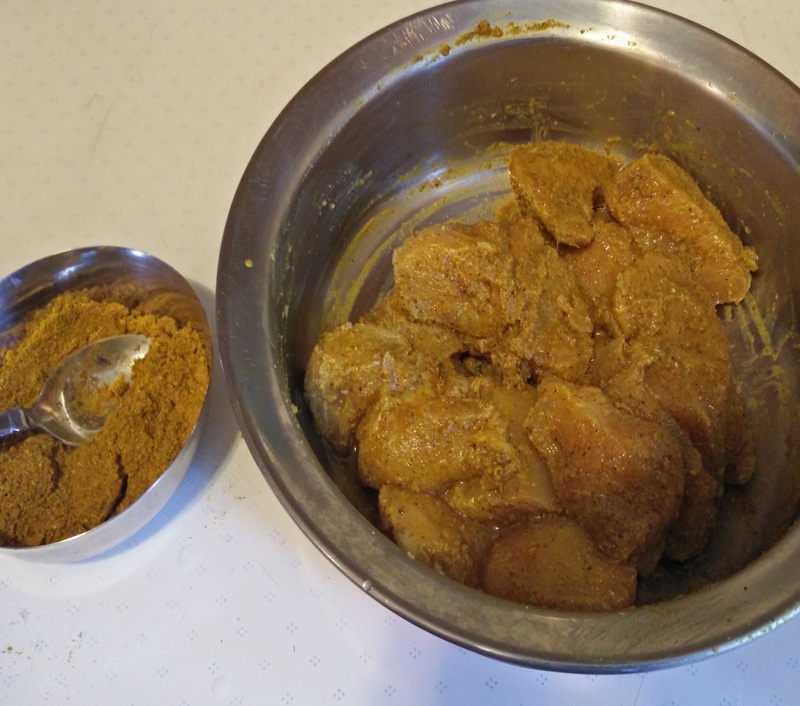 Marinate the chicken with ginger garlic paste, pepper, salt, lemon juice and madras curry powder for at least 30 mins. 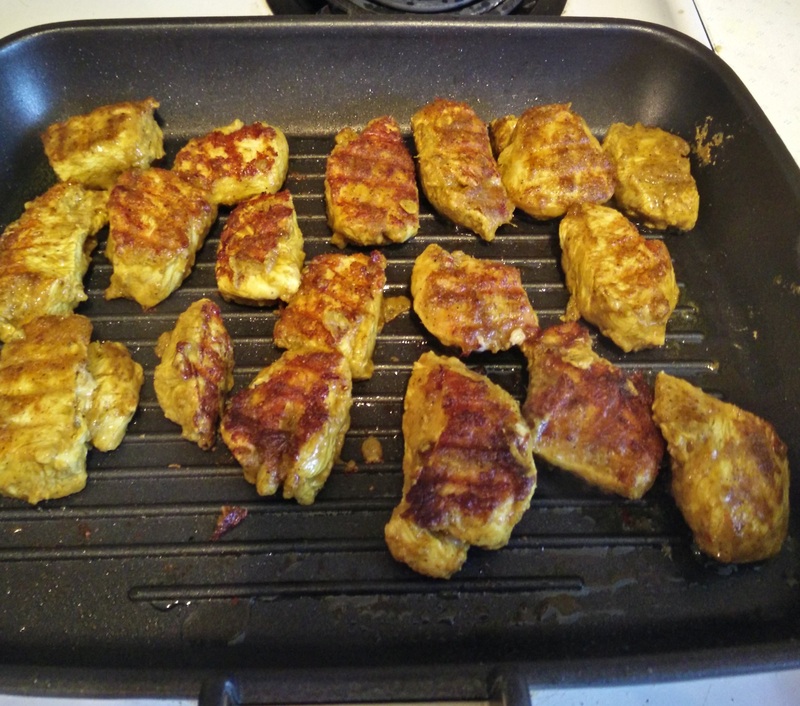 Heat oil in a griddle or grill pan on high heat and place chicken pieces. Cook on both sides for 10 mins until the chicken is cooked. Add onions and bell pepper cubes and cook for a min. 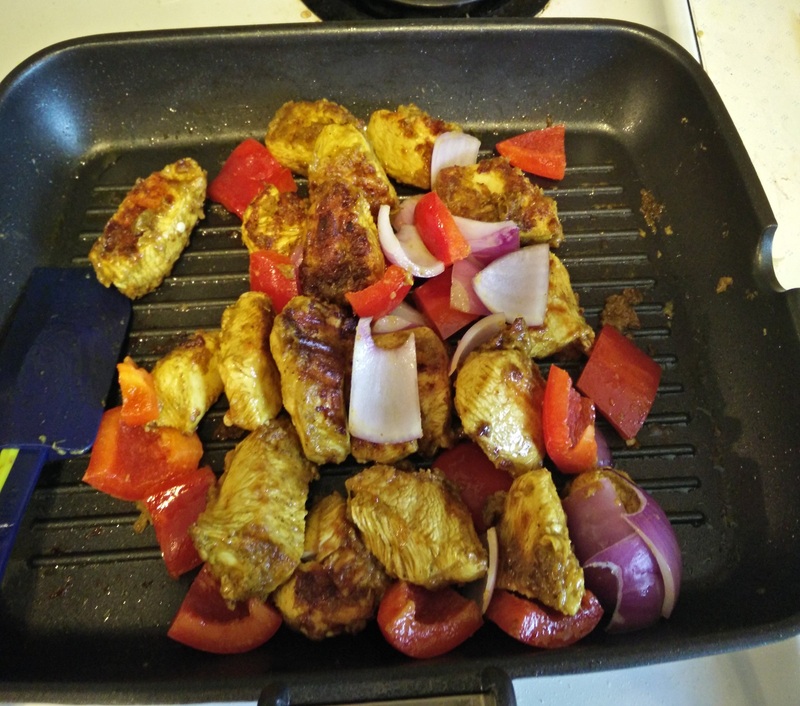 Onions and peppers will absorb the flavor from chicken. Switch off of the flame and skewer onto bamboo sticks or satay sticks and enjoy. It makes half a cup of spice blend. You can store it in air tight container and use to spice lenthils, vegetables or meat based gravies.